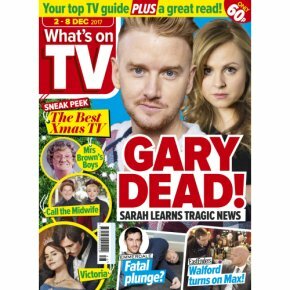 Inside this issue of What's On TV (listings dates 2-8 Dec), don't miss a thing with our sneak peek at what's on over the festive period with our exclusive Christmas Preview. Plus we chat to Claire Foy as the second series of The Crown begins. Over in the Soaps, Sarah receives some devastating news while in EastEnders, Max discovers he's a marked man!